The TL-WR902AC is a low-cost portable wireless router (at the time of writing it's about 35 USD in the USA or 35 EUR in Europe). It's tiny box that provides a Wi-Fi hotspot (access point), optionally providing an internet feed delivered by an ethernet cable, or a USB 3G/4G modem. What we are going to do is flash a custom firmware, which will allow you to connect your camera to the USB port instead of a USB modem, and connect the DSLR Controller app over Wi-Fi. This will essentially add a Wi-Fi function to any Canon EOS model. Unlike the TL-MR3040, the TL-WR902AC does not have it's own battery, and thus needs to be powered externally. It is powered by standard microUSB cable, so you can use any portable battery pack (power bank) or even your phone's wall charger. 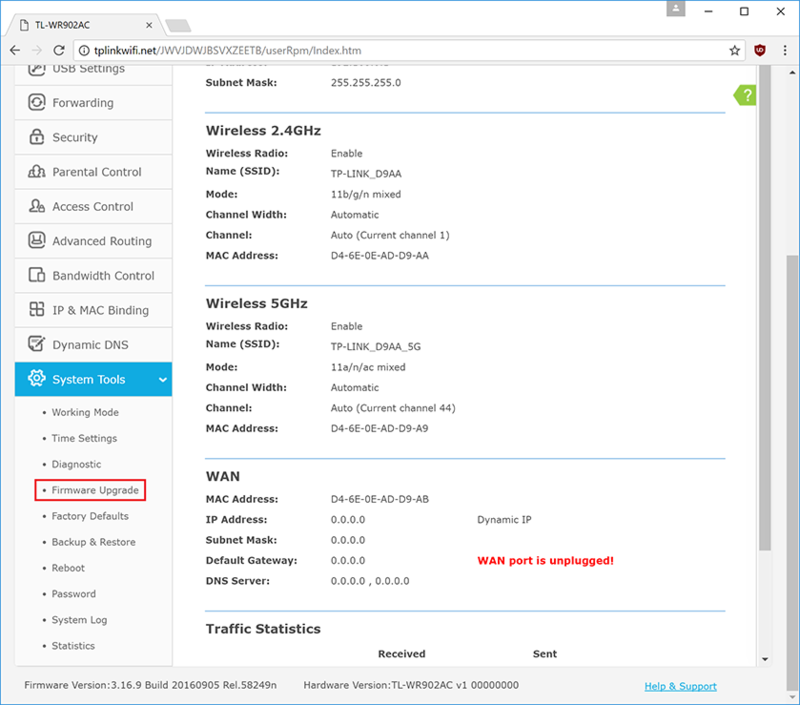 The custom firmware we will be using is based on LEDE (a fork of OpenWRT), which is a fully capable open source router operation system. 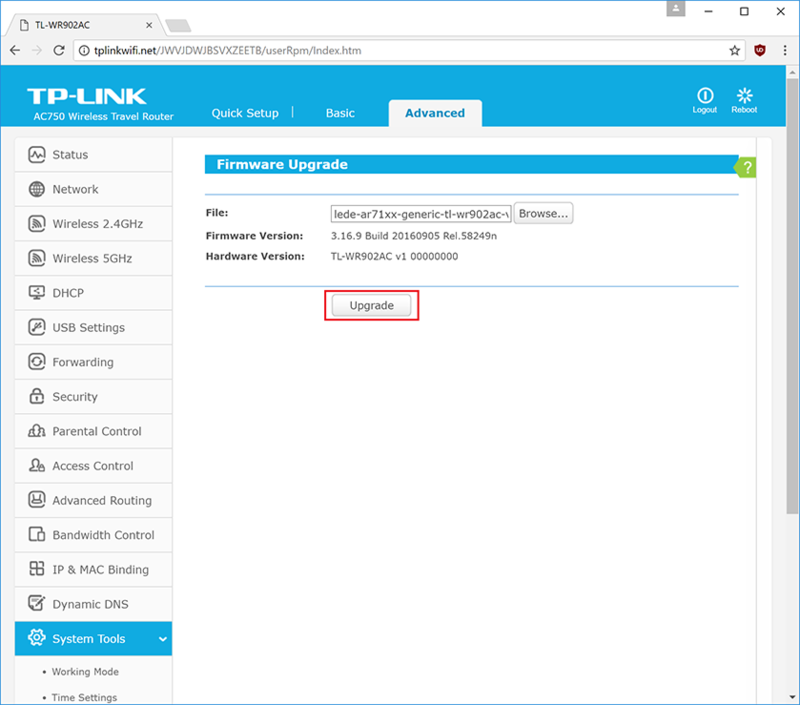 Flashing this custom firmware will still allow you to use your TL-WR902AC as a normal access point, however the functionalities may not match exactly. You should consider this unit lost to DSLR Controller. 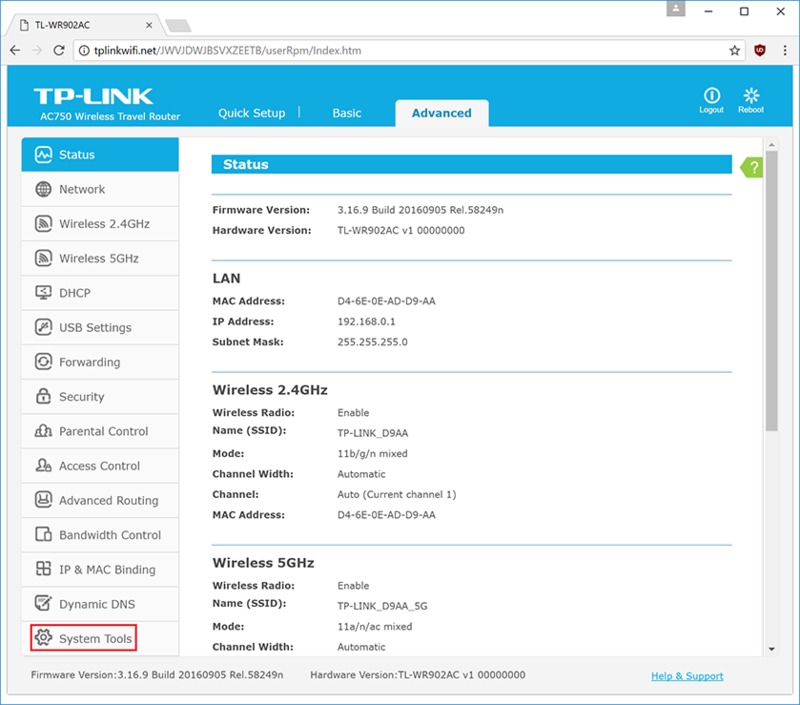 It is technically possible to restore a TP-Link original firmware to the device, but it's a bit of a hassle and we do not explain nor support this operation at this time. 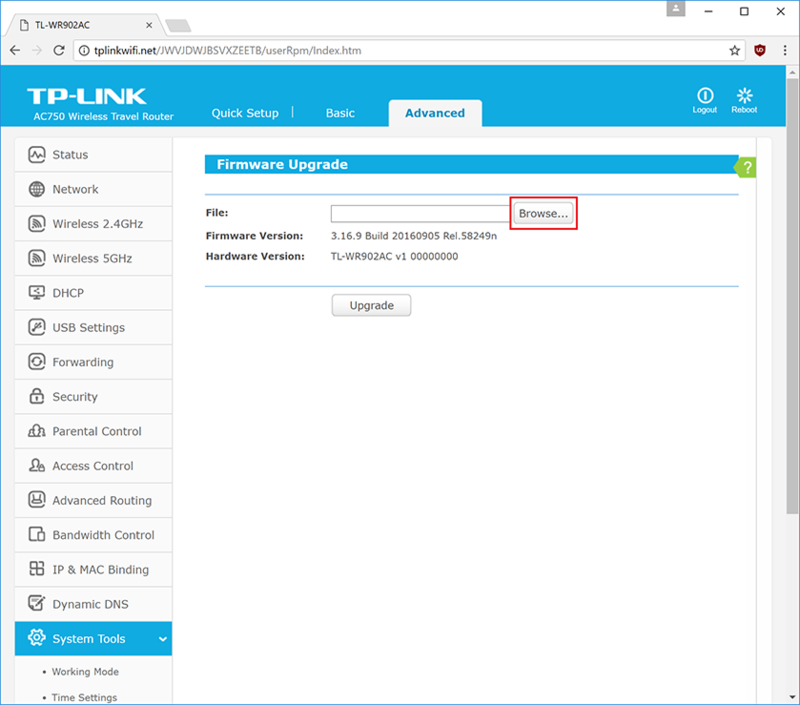 The custom firmware can be flashed directly from the TP-Link management interface. On the back of the device there's a sticker with the information you need. It lists the network name (SSID), network password (PIN), the URL of the management interface, and the username and password for the management interface. 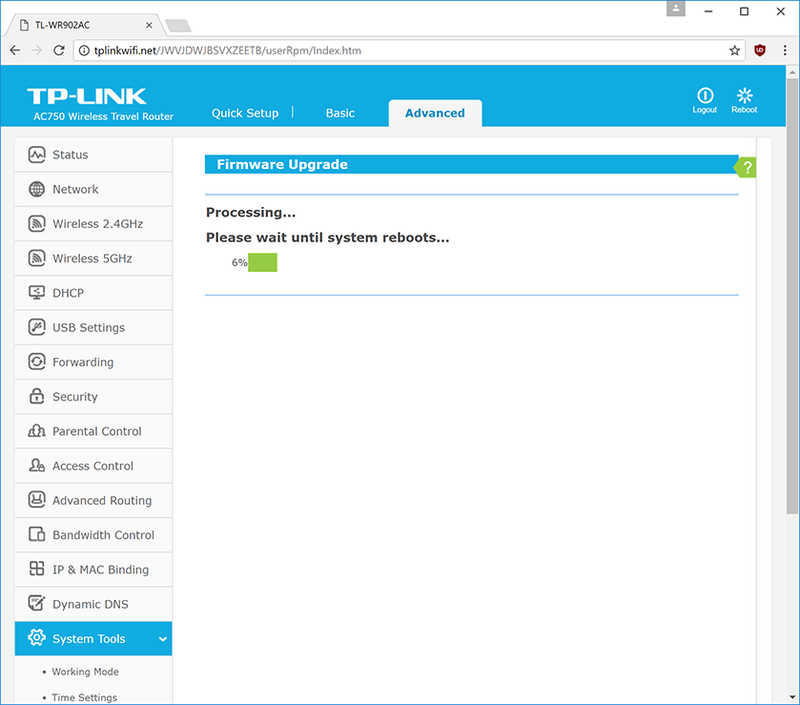 Now that you are inside the management interface, go to Advanced -> System Tools -> Firmware Upgrade, and use the Browse... button to select the firmware file you just downloaded. Press the Upgrade button to flash the firmware. Flashing the firmware will take a minute or two. Watch your Wi-Fi connection status on your computer or laptop, after a few minutes will notice that it has lost Wi-Fi connection. If the LED on the TP-Link is blinking, wait until it stops blinking, then give it another 30 seconds to be sure. Then remove the power plug and put it back in. Another minute later, there should be a Wi-Fi network called DSLRController_2.4G and/or DSLRController_5G. You can close the browser window now. Your TL-WR902AC is now ready for use, but you can customize the above settings first if you wish. The TL-WR902AC supports the B/G/N/AC Wi-Fi standards. 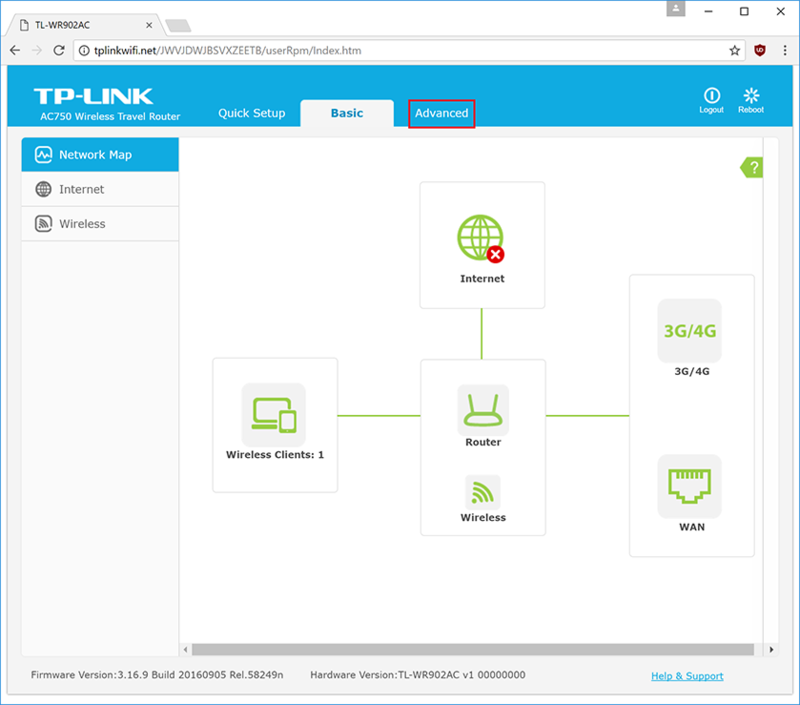 The 2.4G network supports B/G/N, while the 5G network supports N/AC. Not all phones and tablets can see the 5G network. If your device can connect to either, the rule of thumb is to use the 5G network, as it will virtually always be (significantly) faster.